AIE- 455VA Table top QUALITY portable stainless steel twin nozzle retractable vacuum sealer. Standard Hi-flow Venture vacuum system for increased productivity. Makes a 5mm wide impulse seal. Available in 18 " and 24 " wide models. Electro static painted for durable service. Electric foot pedal control. All steel constructed and work shelf included. Can vacuum 2 smaller bags at the same time from either nozzle or both nozzles for vacuuming larger bags. Available up to 61 inches upon special order. 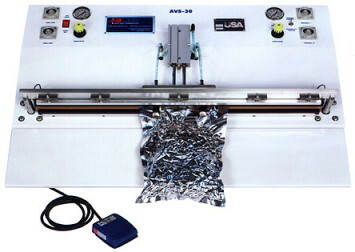 Available in 20 or 30 Inch Lengths The AVS VACUUM SEALER is designed with industrial components to provide you with a heavy duty machine that will last for years and even DECADES! ALL seals are guaranteed to be airtight and watertight, making the AVS Vacuum Sealer ideal for food, medical and electronic applications. The integrity of each seal is accomplished thorough the use of dual 1/4" NiChrome seal bands combined with variable range timers which provide the user with extreme control over seal and cool time. This combination assures faster seals and outstanding seal integrity. We are proud to announce E.L.V.I.S. 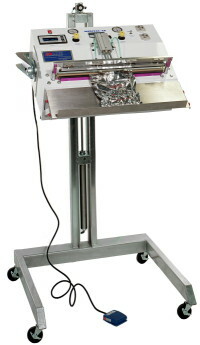 a new and innovative program to design your own high quality stainless steel vacuum sealer. This is ideal for all industrial, electronic, food or clean room requirements, we can provide NIST traceable certificates of calibration. Whether you are an established company or a start-up, this program is unequalled in the benefits provided. A competitively priced entry level vacuum sealer ideal for managing your costs. The ability to design a sealer to include only the components you need for your application. Each sealer will have the same high quality and durability found in all our machinery complete with a two-year warranty. For outstanding vacuum and seal integrity the MEDIVAC line of thermal impulse vacuum sealers is ideal for all your medical packaging requirements. Controls are repeatable and validatable providing FDA/NIST traceability. Each table top unit comes standard with a digital temperature control unit complete with selective alarm functions. Variable timers allow for precise control of vacuum and gas flush. Depending on your selection of barrier materials the sealer can be built with dual elements or a single wide seal ensuring an airtight/watertight seal for prolonged shelf life. The MEDIVAC guarantees the utmost in safety features with a low pressure close and safety reed switches to prevent heat or high pressure until the top and bottom bars are flush. Other standard features include a stainless steel product stop, exhaust port and powder coat finish for clean room compatibility. 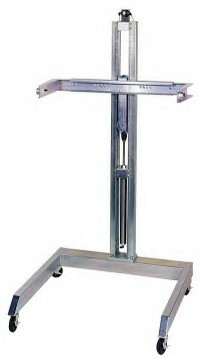 An optional pneumatic stand is available for height adjustment and allows you to select a vertical or horizontal seal method. Water cooling bars can be attached to the heater bar when faster production or rapid cooling is required. Every sealer is engineered with top quality construction and components providing years of trouble free and economical service. All units come complete with a two year warranty , detailed operating manual and a spare parts kit.